Ed. note: Intuit has focused on a simple mission: to improve the financial lives of people so profoundly that they could never imagine going back to the old way of doing things. By solving big underserved problems, we have become woven into the financial lives of more than 50 million small businesses and consumers worldwide. Readers from the United States are most likely familiar with flagship brands: QuickBooks, Quicken and TurboTax. 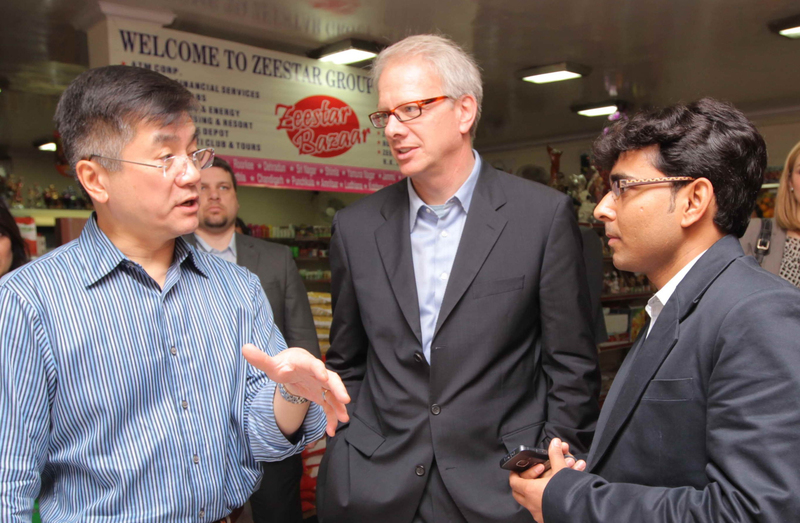 Intuit is proud to join U.S. Commerce Secretary Gary Locke on the business development trade mission to India. It is an honor to represent my company as we contribute to trade that creates jobs for people in both the United States and India. On day one of the mission, I had the privilege of seeing our impact firsthand. Secretary Locke joined us at a neighborhood grocery store in South Delhi that was founded by an Indian national who “exported” his knowlege and experience from running a store in Utah back to India to build a successful business here in the Indian capital. Store manager Deepak Gupta provided a tour of the shop, shared his goals for the business and shed light on how the store has been marketing to the community. The purpose of the trip was to provide Secretary Locke with a “behind-the-scenes” look at what went into developing Intuit’s GoConnect, the new mobile marketing service we created to give small businesses the power to increase visits from existing customers via personalized, targeted mobile marketing campaigns that can be managed via the Web or mobile phones. Using GoConnect, the store has seen a sales increase of seven percent and a concurrent decrease in marketing costs of 90 percent.